“Many members of Congress don’t understand the technical implications here, so let me put in simple terms what cybersecurity experts have been saying for years. : what the FBI is asking Apple to do will make us less safe, not more safe. This is not a choice between privacy and national security. Backdoors in encryption put us all in danger, and make us more vulnerable to the types of attacks that the government says they’re trying to prevent. Secure phones are saving lives every day. The engineers who maintain the IT behind airports, hospitals, power plants—they use iPhones too. If Congress makes our devices less secure by mandating backdoors, they’re putting hundreds of millions of lives at risk. Fight for the Future’s grassroots rallies at Apple stores in nearly 50 cities and at FBI headquarters last Tuesday garnered international headlines and sparked considerable online conversation. 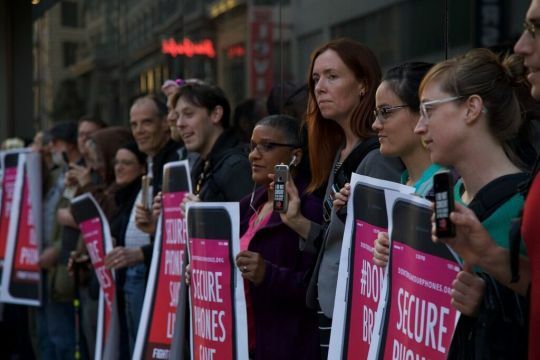 Protesters carried signs reading “Don’t Break Our Phones” and “Secure Phones Save Lives,” countering the narrative that this case is only about personal privacy and working to educate decision-makers about the serious dangers posed by weakening encryption technology. The group, known for organizing some of the largest online protests in history, is planning another significant action opposing the FBI’s demand in the coming weeks.